The 2016 Miami Dolphins season was the franchise's 47th season in the National Football League, the 51st overall and the first under head coach Adam Gase. The season saw the Dolphins trying to improve upon their 6–10 record from 2015. After a lackluster 1–4 start, the Dolphins would claim six straight wins, and finish the season on a 9–2 run. With their Week 15 win over the New York Jets, the Dolphins clinched a winning record for the first time since 2008, and clinched a playoff berth the following week after the Kansas City Chiefs defeated the Denver Broncos, ending their 8-year playoff drought. This made Gase the Dolphins' first rookie coach since Tony Sparano to end a year-long playoff drought and also lead them to a winning record of at least 10 wins. They were also the first AFC East team, other than the New England Patriots, to qualify for the postseason since the 2010 New York Jets. However, they were defeated by the Pittsburgh Steelers in the Wild Card round, ending their season and extending their playoff victory drought to 16 years. On January 2, 2016, two-year general manager Dennis Hickey was fired. On January 4, the Dolphins promoted director of college scouting Chris Grier to replace Hickey as the new general manager. Grier has been with the Dolphins for the past sixteen seasons, nine as the director of scouting. The Dolphins front office, which is made up of owner Stephen Ross, executive vice president of football operations Mike Tannenbaum, CEO Tom Garfinkel, vice chairman Matt Higgins and Grier, developed a committee to find a permanent replacement for former head coach Joe Philbin, who was fired and replaced by tight ends coach Dan Campbell on October 5, 2015. The Dolphins conducted interviews with seven candidates. The candidates included former Atlanta Falcons head coach Mike Smith, former Washington Redskins and Denver Broncos head coach Mike Shanahan, former Buffalo Bills head coach Doug Marrone, Bills assistant head coach Anthony Lynn, Chicago Bears offensive coordinator Adam Gase, Detroit Lions defensive coordinator Teryl Austin and interim head coach Campbell. The Dolphins requested interviews with New England Patriots offensive coordinator Josh McDaniels and defensive coordinator Matt Patricia, as well as Cincinnati Bengals offensive coordinator Hue Jackson. Owner Ross expressed interest in New Orleans Saints head coach Sean Payton; however, on January 6, Payton announced he would remain in New Orleans for another season. On January 9, Gase was hired as the twelfth head coach in Dolphins history. He was the only candidate to receive a second interview. On January 12, Gase hired Bengals' defensive back coach Vance Joseph as defensive coordinator and linebackers coach Matt Burke, who worked with Joseph in Cincinnati, in the same position. Gase also hired Washington Redskins' offensive line assistant Shane Day as tight ends coach, San Francisco 49ers' offensive line coach Chris Foerster in the same position and former NFL wide receiver Shawn Jefferson as the wide receivers coach. Assistant general manager Eric Stokes was promoted to senior personnel executive. On August 16, 2016, the Dolphins announced the naming rights to their home stadium had been sold to Hard Rock International. The stadium, which was known as Sun Life Stadium in 2015 and was being called "New Miami Stadium" during the $500 million renovations completed during the summer of 2016, will be known as "Hard Rock Stadium." The Dolphins entered free agency with 11 unrestricted free agents. – Light green background indicates a player has been re-signed by the Dolphins. – Light red background indicates a player has departed the Dolphins. The Dolphins first addition of 2016 was the signing of wide receiver/cornerback Tyler Davis on January 4, on a futures contract. Davis became the first German Football League player to be signed by an NFL team. March 7, 2016 – The Dolphins acquire LB Kiko Alonso and CB Byron Maxwell from the Philadelphia Eagles in exchange for swapping first round picks (8 and 13). March 8, 2016 – The Dolphins sign DE Mario Williams on a 2-year, $16 million contract. March 9, 2016 – The Dolphins sign S Isa Abdul-Quddus on a 3-year, $12.75 million contract. May 13, 2016 – The Dolphins sign DE Jason Jones on a 1-year, $1.5 million contract. The Dolphins first departure of 2016 was the waiving of offensive tackle Jason Fox, who had one year remaining on his contract, on January 12. The Dolphins also released cornerback Brent Grimes and wide receiver Greg Jennings on March 5, 2016 after an uneventful 2015 season. On March 9, the Dolphins lost Olivier Vernon, Lamar Miller, Derrick Shelby, Kelvin Sheppard, and Rishard Matthews to other teams during free agency. The team traded its first-round selection to the Philadelphia Eagles in exchange for a first-round selection, cornerback Byron Maxwell and linebacker Kiko Alonso. The Baltimore Ravens traded its second-round selection to Miami in exchange for Miami's second and fourth-round selections. Miami traded its fifth-round selection to the New England Patriots in exchange for New England's 2 sixth-round selections and a seventh-round selection. The Dolphins acquired an additional seventh-round selection in a trade that sent cornerback Will Davis to the Baltimore Ravens. SEA – Steven Hauschka 39-yard field goal, 5:11. Seahawks 3–0. Drive: 12 plays, 46 yards, 6:08. MIA – Andrew Franks 41-yard field goal, 8:45. Tied 3–3. Drive: 6 plays, 19 yards, 2:06. SEA – Steven Hauschka 38-yard field goal, 0:00. Seahawks 6–3. Drive: 10 plays, 72 yards, 1:52. MIA – Ryan Tannehill 2-yard run (Andrew Franks kick), 4:08. Dolphins 10–6. Drive: 7 plays, 86 yards, 3:01. SEA – Doug Baldwin 2-yard pass from Russell Wilson (kick blocked), 0:31. Seahawks 12–10. Drive: 14 plays, 75 yards, 3:37. The Dolphins opened their 2016 season at Seattle. This game would mark their first visit to Seattle since 2004. In the first quarter, the Dolphins would trail early as Steven Hauschka nailed a 39-yard field goal, giving Seattle a 3–0 lead. Miami would tie the game 3–3 on an Andrew Franks 41-yard field goal. But, the Seahawks would retake the lead on another Hauschka field goal, this time from 38 yards. After a scoreless 3rd quarter, Miami would finally take their first lead on a Ryan Tannehill 2 yard touchdown run, giving Miami a 10–6 lead with 4:08 left. However, Seattle would march down the field and take the lead for good, as Russell Wilson found Doug Baldwin from 2 yards out. With the loss, Miami started their season 0–1. After trailing 31–3 for most of the game, Miami made the game close, but the comeback was short, as the Patriots held on for the win. With the loss, Miami fell to 0–2 for the first time since 2011. MIA – DeVante Parker 26-yard pass from Ryan Tannehill (Andrew Franks kick), 10:16. Dolphins 7–0. Drive: 5 plays, 61 yards, 2:37. CLE – Cody Parkey 46-yard field goal, 13:32. Dolphins 7–3. Drive: 10 plays, 58 yards, 5:03. CLE – Briean Boddy-Calhoun 27-yard interception return (Cody Parkey kick), 6:47. Browns 10–7. MIA – Andrew Franks 37-yard field goal, 1:57. Tied 10–10. Drive: 10 plays, 56 yards, 4:50. CLE – Cody Parkey 48-yard field goal, 0:42. Browns 13–10. Drive: 8 plays, 45 yards, 1:15. MIA – Jarvis Landry 42-yard pass from Ryan Tannehill (Andrew Franks kick), 5:17. Dolphins 17–13. Drive: 4 plays, 68 yards, 2:10. MIA – Damien Williams 10-yard pass from Ryan Tannehill (Andrew Franks kick), 14:17. Dolphins 24–13. Drive: 6 plays, 64 yards, 3:16. CLE – Terrelle Pryor 3-yard run (Cody Kessler–Gary Barnidge pass), 10:12. Dolphins 24–21. Drive: 9 plays, 83 yards, 4:05. CLE – Cody Parkey 38-yard field goal, 3:14. Tied 24–24. Drive: 8 plays, 74 yards, 3:03. MIA – Jay Ajayi 11-yard run, 8:26. Dolphins 30–24. Drive: 3 plays, 44 yards, 1:13. Cleveland kicker Cody Parkey missed three field goals in the game, including a potential game winner with no time left on the clock. After both teams failed on their opening drive of the overtime period, Jay Ajayi capped a three-play, 44-yard drive with an 11-yard run into the end zone to give Miami the win. With that, the Dolphins improved to 1–2. CIN – Mike Nugent 42-yard field goal, 9:51. Bengals 3–0. Drive: 11 plays, 54 yards, 5:09. MIA – Kenny Stills 74-yard pass from Ryan Tannehill (Andrew Franks kick), 9:04. Dolphins 7–3. Drive: 2 plays, 81 yards, 0:47. CIN – A. J. Green 7-yard pass from Andy Dalton (Mike Nugent kick), 3:19. Bengals 10–7. Drive: 7 plays, 90 yards, 3:24. CIN – Mike Nugent 22-yard field goal, 4:12. Bengals 13–7. Drive: 14 plays, 80 yards, 8:25. CIN – Mike Nugent 43-yard field goal, 1:06. Bengals 16–7. Drive: 4 plays, 2 yards, 1:01. CIN – Mike Nugent 22-yard field goal, 6:09. Bengals 19–7. Drive: 9 plays, 85 yards, 4:16. CIN – Mike Nugent 47-yard field goal, 13:30. Bengals 22–7. Drive: 10 plays, 45 yards, 5:25. The Dolphins wore orange Color Rush uniforms for this game. The Bengals dominated this game from start to finish, forcing two Miami turnovers. With the loss, the Dolphins fell to 1–3. TEN – Marcus Mariota 5-yard run (Ryan Succop kick), 0:23. Titans 7–0. Drive: 5 plays, 61 yards, 2:49. MIA – Jakeem Grant 74-yard punt return (Andrew Franks kick), 12:23. Tied 7–7. TEN – Andre Johnson 5-yard pass from Marcus Mariota (Ryan Succop kick), 5:30. Titans 14–7. Drive: 12 plays, 76 yards, 6:53. MIA – Jay Ajayi 4-yard run (Andrew Franks kick), 2:00. Tied 14–14. Drive: 6 plays, 79 yards, 3:30. TEN – Delanie Walker 20-yard pass from Marcus Mariota (Ryan Succop kick), 0:47. Titans 21–14. Drive: 6 plays, 75 yards, 1:13. TEN – Ryan Succop 40-yard field goal, 10:33. Titans 24–14. Drive: 4 plays, 2 yards, 1:25. MIA – Andrew Franks 24-yard field goal, 5:10. Titans 24–17. Drive: 8 plays, 69 yards, 5:23. TEN – Rishard Matthews 4-yard pass from Marcus Mariota (kick blocked), 8:23. Titans 30–17. Drive: 9 plays, 66 yards, 4:54. In the first of three games at home before their bye, the Dolphins gave up an early lead to the Tennessee Titans that they failed to overturn, as they fell to 1–4. Tannehill was sacked six times in the game. MIA – Andrew Franks 30-yard field goal, 8:34. Dolphins 3–0. Drive: 9 plays, 53 yards, 3:39. PIT – Darrius Heyward-Bey 60-yard run (Ben Roethlisberger–Le'Veon Bell pass), 5:39. Steelers 8–3. Drive: 6 plays, 75 yards, 2:55. MIA – Andrew Franks 23-yard field goal, 8:18. Steelers 8–6. Drive: 12 plays, 85 yards, 7:08. MIA – Andrew Franks 30-yard field goal, 5:23. Dolphins 9–8. Drive: 4 plays, 1 yard, 2:43. MIA – Damien Williams 1-yard run (Andrew Franks kick), 0:21. Dolphins 16–8. Drive: 9 plays, 71 yards, 2:26. MIA – Jay Ajayi 1-yard run (Andrew Franks kick), 1:39. Dolphins 23–8. Drive: 6 plays, 52 yards, 3:31. PIT – Cobi Hamilton 23-yard pass from Ben Roethlisberger (Chris Boswell kick), 1:02. Dolphins 23–15. Drive: 10 plays, 97 yards, 3:18. MIA – Jay Ajayi 62-yard run (Andrew Franks kick), 0:50. Dolphins 30–15. Drive: 1 play, 62 yards, 0:12. Ben Roethlisberger was injured and taken out of the game briefly after throwing two interceptions and tearing his meniscus. The Steelers led 8–3 with less than 10 minutes played in the first quarter, but the Dolphins outscored the Steelers 27–7 for the remainder of the game. With the win, the Dolphins improved to 2–4, and started a six-game winning streak. MIA – Andrew Franks 36-yard field goal, 7:28. Dolphins 3–0. Drive: 15 plays, 64 yards, 7:32. BUF – Dan Carpenter 29-yard field goal, 0:49. Tied 3–3. Drive: 6 plays, 20 yards, 1:59. BUF – Tyrod Taylor 10-yard run (Dan Carpenter kick), 11:47. Bills 10–3. Drive: 7 plays, 40 yards, 2:50. MIA – Andrew Franks 33-yard field goal, 3:47. Bills 10–6. Drive: 12 plays, 58 yards, 8:00. BUF – Marquise Goodwin 67-yard pass from Tyrod Taylor (Dan Carpenter kick), 5:51. Bills 17–6. Drive: 1 play, 67 yards, 0:09. MIA – Jay Ajayi 4-yard run (Ryan Tannehill–Jarvis Landry pass), 0:18. Bills 17–14. Drive: 10 plays, 75 yards, 5:33. MIA – Damien Williams 12-yard run (Andrew Franks kick), 3:56. Dolphins 21–17. Drive: 6 plays, 64 yards, 3:49. MIA – Kenny Stills 66-yard pass from Ryan Tannehill (Andrew Franks kick), 2:24. Dolphins 28–17. Drive: 3 plays, 70 yards, 1:03. BUF – Reggie Bush 1-yard run (Tyrod Taylor–Reggie Bush pass), 0:14. Dolphins 28–25. Drive: 13 plays, 75 yards, 2:10. The Dolphins trailed 17–6 going into the final minute of the third quarter, but three consecutive touchdowns by the Dolphins gave them a 28–25 win and they improved to 3–4. Running back Jay Ajayi became the first Dolphins running back to rush for over 200 yards in consecutive games since Ricky Williams accomplished the feat in 2002. NYJ – Nick Folk 23-yard field goal, 8:26. Jets 3–0. Drive: 13 plays, 70 yards, 6:34. MIA – Jay Ajayi 20-yard run (Andrew Franks kick), 4:56. Dolphins 7–3. Drive: 6 plays, 75 yards, 3:30. NYJ – Matt Forte 31-yard run (Nick Folk kick), 0:35. Jets 10–7. Drive: 7 plays, 75 yards, 4:21. MIA – Dominique Jones 1-yard pass from Ryan Tannehill (Andrew Franks kick), 10:16. Dolphins 14–10. Drive: 11 plays, 75 yards, 5:19. NYJ – Nick Folk 21-yard field goal, 5:20. Dolphins 14–13. Drive: 9 plays, 75 yards, 4:56. MIA – Andrew Franks 33-yard field goal, 5:08. Dolphins 17–13. Drive: 10 plays, 56 yards, 4:53. MIA – Andrew Franks 29-yard field goal, 3:22. Dolphins 20–13. Drive: 4 plays, 3 yards, 1:38. NYJ – Nick Folk 28-yard field goal, 12:50. 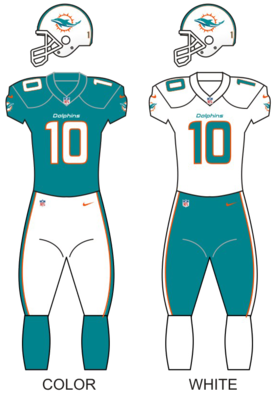 Dolphins 20–16. Drive: 9 plays, 67 yards, 5:32. NYJ – Jalin Marshall 18-yard pass from Ryan Fitzpatrick (Nick Folk kick), 5:42. Jets 23–20. Drive: 2 plays, 18 yards, 0:10. MIA – Kenyan Drake 96-yard kickoff return (Andrew Franks kick), 5:15. Dolphins 27–23. Drive: 0 plays, 0 yards, 0:27. The Dolphins had the lead going into the fourth quarter, only for Jalin Marshall to put the Jets ahead with less than six minutes to go; however, Kenyan Drake returned the ensuing kickoff 96 yards for a touchdown to give the Dolphins the win, and they improved to 4–4. They also defeated the Jets at home for the first time since 2011. SD – Josh Lambo 45-yard field goal, 14:51. Chargers 3–0. Drive: 7 plays, 46 yards, 3:03. SD – Antonio Gates 11-yard pass from Philip Rivers (Josh Lambo kick), 7:37. Chargers 10–0. Drive: 9 plays, 80 yards, 4:53. MIA – Kenny Stills 39-yard pass from Ryan Tannehill (Andrew Franks kick), 2:50. Chargers 10–7. Drive: 9 plays, 74 yards, 4:47. MIA – Damien Williams 2-yard run (Andrew Franks kick), 12:29. Dolphins 14–10. Drive: 5 plays, 75 yards, 2:31. SD – Hunter Henry 7-yard pass from Philip Rivers (Josh Lambo kick), 5:36. Chargers 17–14. Drive: 12 plays, 75 yards, 6:53. MIA – Damien Williams 18-yard pass from Ryan Tannehill (Andrew Franks kick), 1:43. Dolphins 21–17. Drive: 8 plays, 75 yards, 3:53. SD – Tyrell Williams 51-yard pass from Philip Rivers (Josh Lambo kick), 4:04. Chargers 24–21. Drive: 4 plays, 58 yards, 1:02. MIA – Andrew Franks 27-yard field goal, 2:57. Tied 24–24. Drive: 5 plays, 66 yards, 1:07. MIA – Kiko Alonso 60-yard interception return (Andrew Franks kick), 1:01. Dolphins 31–24. The Dolphins would intercept Philip Rivers four times in the second half. Towards the end of the game, Kiko Alonso returned an interception 60 yards for the game-winning touchdown. With the win, the Dolphins went to 5–4. Miami trailed 10–0 with just over four minutes remaining, but touchdown passes from quarterback Ryan Tannehill to Jarvis Landry and DeVante Parker put the Dolphins up by four points with 36 seconds left on the clock. The Rams' rookie quarterback Jared Goff attempted a hail mary pass to try and give the Rams the win, but the pass was incomplete, resulting in a 14–10 win for the Dolphins. With the win, the Dolphins improved to 6–4. They also improved to 11–2 all-time against the Rams. It was also the Dolphins' first time meeting with the Los Angeles-based Rams since 1992. SF – Carlos Hyde 11-yard pass from Colin Kaepernick (Phil Dawson kick), 9:46. 49ers 7–0. Drive: 8 plays, 62 yards, 3:30. MIA – Jay Ajayi 2-yard run (Andrew Franks kick), 12:22. Tied 7–7. Drive: 11 plays, 91 yards, 5:28. MIA – Dion Sims 16-yard pass from Ryan Tannehill (Andrew Franks kick), 2:17. Dolphins 14–7. Drive: 11 plays, 84 yards, 6:50. MIA – Andrew Franks 24-yard field goal, 12:31. Dolphins 17–7. Drive: 5 plays, 20 yards, 2:18. SF – Garrett Celek 4-yard pass from Colin Kaepernick (Phil Dawson kick), 7:34. Dolphins 17–14. Drive: 9 plays, 91 yards, 4:57. MIA – Kenny Stills 43-yard pass from Ryan Tannehill (Andrew Franks kick), 1:33. Dolphins 24–14. Drive: 5 plays, 60 yards, 1:50. MIA – Leonte Carroo 15-yard pass from Ryan Tannehill (Andrew Franks kick), 11:31. Dolphins 31–14. Drive: 6 plays, 67 yards, 3:23. SF – Torrey Smith 1-yard pass from Colin Kaepernick (Phil Dawson kick), 7:42. Dolphins 31–21. Drive: 8 plays, 75 yards, 3:49. SF – Phil Dawson 36-yard field goal, 2:15. Dolphins 31–24. Drive: 14 plays, 62 yards, 3:36. Holding a seven-point lead inside the two-minute warning, the Dolphins stopped 49ers quarterback Colin Kaepernick just short of the end zone as time expired to claim a 31–24 win. With the win, the Dolphins improved to 7–4. BAL – Terrance West 3-yard pass from Joe Flacco (Justin Tucker kick), 10:57. Ravens 7–0. Drive: 8 plays, 79 yards, 4:03. BAL – Dennis Pitta 13-yard pass from Joe Flacco (Justin Tucker kick), 3:17. Ravens 14–0. Drive: 8 plays, 63 yards, 3:37. BAL – Dennis Pitta 9-yard pass from Joe Flacco (Justin Tucker kick), 2:10. Ravens 21–0. Drive: 18 plays, 88 yards, 8:57. BAL – Justin Tucker 55-yard field goal, 0:00. Ravens 24–0. Drive: 7 plays, 48 yards, 0:59. MIA – DeVante Parker 8-yard pass from Ryan Tannehill (pass failed), 14:42. Ravens 24–6. Drive: 1 play, 8 yards, 0:05. BAL – Breshad Perriman 53-yard pass from Joe Flacco (Justin Tucker kick), 12:49. Ravens 31–6. Drive: 4 plays, 75 yards, 1:53. BAL – Terrance West 9-yard run (Justin Tucker kick), 5:55. Ravens 38–6. Drive: 4 plays, 41 yards, 1:26. This loss snapped the Dolphins' six-game winning streak and they fell to 7–5. MIA – Kenny Stills 28-yard pass from Ryan Tannehill (Andrew Franks kick), 9:27. Dolphins 7–0. Drive: 4 plays, 52 yards, 2:09. ARI – J. J. Nelson 56-yard run (kick failed, wide left), 8:00. Dolphins 7–6. Drive: 3 plays, 75 yards, 1:27. MIA – Dion Sims 7-yard pass from Ryan Tannehill (Andrew Franks kick), 11:41. Dolphins 14–6. Drive: 5 plays, 43 yards, 2:55. ARI – Chandler Catanzaro 56-yard field goal, 1:18. Dolphins 14–9. Drive: 4 plays, 0 yards, 0:21. MIA – Damien Williams 3-yard pass from Ryan Tannehill (Andrew Franks kick), 11:17. Dolphins 21–9. Drive: 6 plays, 77 yards, 3:43. ARI – Brittan Golden 9-yard pass from Carson Palmer, 7:05. Dolphins 21–15. Drive: 12 plays, 99 yards, 6:43. MIA – Walt Aikens defensive two-point conversion, 7:05. Dolphins 23–15. ARI – J. J. Nelson 8-yard pass from Carson Palmer (Carson Palmer–David Johnson pass), 3:01. Tied 23–23. Drive: 7 plays, 50 yards, 2:13. MIA – Andrew Franks 21-yard field goal, 0:00. Dolphins 26–23. Drive: 6 plays, 44 yards, 1:29. On a wet day in Miami, Andrew Franks kicked the game-winning field goal as time expired to give the Dolphins a 26–23 win over the Arizona Cardinals. With the win, the Dolphins went to 8–5. They also snapped their three-game losing streak against the Cardinals. Ryan Tannehill suffered a season-ending knee injury when he was hit low by Calais Campbell although the injury was diagnosed as a sprain and not a torn ACL as was originally feared. NYJ – Robby Anderson 40-yard pass from Bryce Petty (Nick Folk kick), 11:32. Jets 7–0. Drive: 7 plays, 75 yards, 3:28. MIA – Dion Sims 1-yard pass from Matt Moore (kick failed, hit left upright), 10:57. Jets 7–6. Drive: 8 plays, 52 yards, 4:23. MIA – Kenny Stills 52-yard pass from Matt Moore (Andrew Franks kick), 1:58. Dolphins 13–7. Drive: 3 plays, 53 yards, 1:51. NYJ – Nick Folk 48-yard field goal, 0:18. Dolphins 13–10. Drive: 11 plays, 48 yards, 1:40. MIA – Walt Aikens 11-yard return of blocked punt (Andrew Franks kick), 10:30. Dolphins 20–10. MIA – Dion Sims 1-yard pass from Matt Moore (Andrew Franks kick), 7:43. Dolphins 27–10. Drive: 5 plays, 60 yards, 2:32. MIA – Jarvis Landry 66-yard pass from Matt Moore (Andrew Franks kick), 6:26. Dolphins 34–10. Drive: 1 play, 66 yards, 0:10. NYJ – Nick Folk 36-yard field goal, 5:43. Dolphins 34–13. Drive: 9 plays, 37 yards, 4:08. With the blowout Saturday night win on the road, the Dolphins improved to 9–5, their first winning season since 2008. Matt Moore was named AFC Offensive Player of the Week for his four-touchdown performance. MIA – Jay Ajayi 2-yard run (Andrew Franks kick), 6:24. Dolphins 7–0. Drive: 9 plays, 72 yards, 4:13. MIA – Kenyan Drake 45-yard run (Andrew Franks kick), 13:34. Dolphins 14–0. Drive: 4 plays, 64 yards, 1:55. BUF – Sammy Watkins 38-yard pass from Tyrod Taylor (Dan Carpenter kick), 5:06. Dolphins 14–7. Drive: 6 plays, 79 yards, 2:45. MIA – DeVante Parker 56-yard pass from Matt Moore (Andrew Franks kick), 12:05. Dolphins 21–7. Drive: 5 plays, 70 yards, 2:55. BUF – LeSean McCoy 19-yard run (Dan Carpenter kick), 6:46. Dolphins 21–14. Drive: 10 plays, 77 yards, 5:19. MIA – Kenny Stills 6-yard pass from Matt Moore (Andrew Franks kick), 3:14. Dolphins 28–14. Drive: 6 plays, 75 yards, 3:32. BUF – Charles Clay 18-yard pass from Tyrod Taylor (Dan Carpenter kick), 2:02. Dolphins 28–21. Drive: 4 plays, 78 yards, 2:02. BUF – Dan Carpenter 28-yard field goal, 5:51. Dolphins 28–24. Drive: 10 plays, 89 yards, 4:24. BUF – Charles Clay 7-yard pass from Tyrod Taylor (Dan Carpenter kick), 1:20. Bills 31–28. Drive: 10 plays, 89 yards, 2:40. MIA – Andrew Franks 55-yard field goal, 0:06. Tied 31–31. Drive: 6 plays, 24 yards, 1:14. MIA – Andrew Franks 27-yard field goal, 0:47. Dolphins 34–31. Drive: 7 plays, 77 yards, 3:13. Miami needed a 56-yard field goal by Andrew Franks to force overtime, and the combination of a missed Dan Carpenter FG attempt by Buffalo and a 57-yard run by Jay Ajayi set Franks up to make the game-winning kick. This clinched Miami's first 10-win season since 2008, and after the Christmas Day win by Kansas City over Denver, it also led to Miami's first playoff berth in eight years. NE – Martellus Bennett 2-yard pass from Tom Brady (Stephen Gostkowski kick), 7:28. Patriots 7–0. Drive: 13 plays, 75 yards, 7:32. NE – Michael Floyd 14-yard pass from Tom Brady (Stephen Gostkowski kick), 3:44. Patriots 14–0. Drive: 5 plays, 45 yards, 1:59. NE – Stephen Gostkowski 40-yard field goal, 14:56. Patriots 17–0. Drive: 8 plays, 34 yards, 2:58. NE – Stephen Gostkowski 26-yard field goal, 3:21. Patriots 20–0. Drive: 15 plays, 52 yards, 8:19. MIA – Jarvis Landry 8-yard pass from Matt Moore (Andrew Franks kick), 0:28. Patriots 20–7. Drive: 10 plays, 75 yards, 2:53. MIA – Kenny Stills 25-yard pass from Matt Moore (Andrew Franks kick), 8:39. Patriots 20–14. Drive: 12 plays, 75 yards, 6:21. NE – Julian Edelman 77-yard pass from Tom Brady (Stephen Gostkowski kick), 6:41. Patriots 27–14. Drive: 3 plays, 80 yards, 1:58. NE – LeGarrette Blount 1-yard run (Tom Brady–Julian Edelman pass), 5:33. Patriots 35–14. Drive: 6 plays, 18 yards, 3:02. With the loss, Miami ended their season 10–6 and finished as the 6th seed in the AFC. ^ Kelly, Omar (January 2, 2016). "Dolphins to fire GM Dennis Hickey". Sun-Sentinel. Retrieved January 4, 2016. ^ Perkins, Chris (January 4, 2016). "Dolphins name Chris Grier general manager". Sun-Sentinel. Retrieved January 4, 2016. ^ Perkins, Chris (January 4, 2016). "Grier: Dolphins are going to build a competitive roster at all positions". Sun-Sentinel. Retrieved January 4, 2016. ^ Hyde, Dave (October 5, 2015). "Dolphins name Chris Grier general manager". Sun-Sentinel. Retrieved January 4, 2016. ^ Kelly, Omar (January 4, 2016). "Former Falcons coach Mike Smith becomes first coach to formally interview". Sun-Sentinel. Retrieved January 4, 2016. ^ a b Kelly, Omar (January 5, 2016). "Dolphins have expressed interest in Sean Payton, source says". Sun-Sentinel. Retrieved January 5, 2016. ^ Beasley, Adam (January 9, 2016). "Dolphins name Chris Grier general manager". Miami Herald. Retrieved January 9, 2016. ^ Beasley, Adam (January 12, 2016). "Miami Dolphins name Vance Joseph defensive coordinator, hire other assistants". Miami Herald. Retrieved January 13, 2016. ^ Houtz, Josh. "Dolphins sell naming rights to Hard Rock International". The Phinsider. The Phinsider. Retrieved August 17, 2016. ^ "Dolphins UFA". Spotrac. January 4, 2016. Retrieved January 5, 2016. ^ Jackson, Barry (January 4, 2016). "New Dolphins GM Chris Grier vows 'talk of dysfunction' within organization is over". Miami Herald. Retrieved January 5, 2016. ^ a b Chase, Chris (March 10, 2016). "Dolphins complete trade for Byron Maxwell, Kiko Alonso". ESPN. Retrieved March 10, 2016. ^ Patra, Kevin (March 8, 2016). "Mario Williams agrees to two-year deal with Dolphins". NFL.com. Retrieved March 8, 2016. ^ Beasley, Adam H. (March 10, 2016). "Miami Dolphins sign safety Isa Abdul-Quddus". Miami Herald. Retrieved 2016-03-11. ^ Jackson, Barry (January 12, 2016). "Miami Dolphins waive Jason Fox". Miami Herald. Retrieved January 13, 2016. ^ Perkins, Chris (April 29, 2016). "Dolphins trade up, select CB Xavien Howard in second round of NFL draft". Sun-Sentinel. Retrieved April 29, 2016. ^ Frenz, Erik (April 30, 2016). "Patriots pull off draft trades with Dolphins and Seahawks involving 147th pick". Boston.com. Retrieved April 30, 2016.